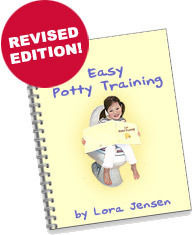 Potty training can be challenging and difficult. While most parents look forward to the end of diapers, messes, and accidents, it's only natural that toilet training inspires dread in some of even the most seasoned moms and dads. Here are some potty training tips that, if you'll just give them a try, may have you scratching your head and wondering why you were so nervous about potty training in the first place! Incentives-Choose something your child likes, such as a sticker chart and star stickers, a bag of little toys to choose from, or treats. Every time your child is successful, give him have a reward from your arsenal of goodies. Involvement-Let your child be involved in cleaning up his messes, wiping himself, getting clean undies, or throwing a dirty diaper away. Underwear Ceremony-Discuss with your child that it may be time to change into regular underwear. Throw a party to make it official. After that, it becomes his responsibility to care for soiled underwear. He may need to hang his undies to dry, or scrub out stains and messes. You can make him responsible for getting and changing into a clean pair of underpants when need be. Easy Does it-Make a rule that he can only have bowel movements in the bathroom. That means that even if he is still in diapers, he can walk into the bathroom and dirty his diaper while in that room. That gets him used to the idea that the bathroom is the place where people have movements. You can teach him to take his diaper on and off and to sit on the toilet, if he likes. Make sure he gets lots of praise, every step of the way. Make it a Habit-Have him sit on the potty for 5-10 minutes every few hours, even if he's not yet comfortable with the idea of using the toilet for its intended purpose. Praise him for sitting there. Never Punish-Never, ever, make him feel bad about having an accident, being wet, or being dirty. You can verbalize and let him feel your disappointment, but never raise your voice or lay a guilt trip on him. Positive Attitude: Always let you child feel good about potty training and be sure to praise every success and every attempt to be successful that your child makes--even if it ends in an accident.